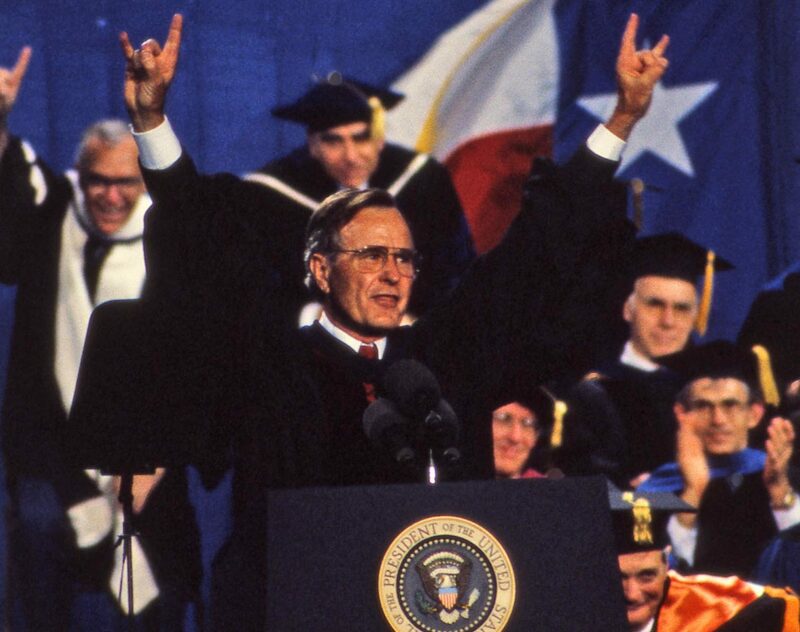 The University of Texas at Austin is joining people across the nation to celebrate the life and legacy of the 41st President of the United States, George H.W. Bush. “Whatever you do, live a life of adventure and meaning so brilliant that, like a Roman candle, it lights up the world…. His recent passing has been felt in every corner of our country, but nowhere more acutely than in our state, his home — Texas. To honor President Bush, Gov. Greg Abbott has declared Wednesday, Dec. 5 an official Day of Mourning. At 10 a.m., the university observed a moment of silence following the hourly Tower bell chime. Afterward, a special concert was performed on the Carillon. Wednesday evening, the UT Tower will be darkened with the number 41 lighted in the windows. The Briscoe Center for American History is displaying images from the archive of President Bush’s official White House Photographer, David Valdez. “President Bush led with the clarity of his convictions and he never lost the spirit of sacrifice that carried him across oceans as a teenager to fight for freedom in World War II. He moved to Texas after the war and laid deep roots here. He loved this state and reflected its spirit in his strong, principled leadership,” said President Gregoy L. Fenves in a message to campus. “Fitting advice from a man who was just that — extraordinary,” Fenves said. Read President Gregory L. Fenves’ full message remembering President Bush here.